Logging technology has changed considerably in recent years. Manual labour has been increasingly replaced by machinery. Only by comparison of the costs and benefits could safe judgements be made on various alternatives. The extraction from compartments of forest products is a very difficult, expensive and time-consuming operation. This problem is very important because the forests in Turkey are located in mountainous areas. The extraction of forest products without loss of quality and quantity, nor damage to the environment, is an important problem. Any activity in wood harvesting requires the employment of machinery and labour in an appropriate combination. All economic activity requires analysis and control of costs and performance. The objective of this study is to identify an intermediate logging technique, which would improve efficiency in wood harvesting for forest enterprises. The intention is to reduce manual labour by using appropriate machinery and therefore make logging operations economic for the worker and the forest enterprise. This study was carried out on very steep and difficult terrain. Whole trees were logged uphill to the forest road by a Koller K300 cable crane. Logging performance was very good because logging distance was relatively short. Investigations were carried out by time studies for which the repetitive (multimoment) method was selected. Through time studies, the productivity and cost of the Koller cable system were evaluated. As a result of measurements by a Koller K300 yarder, mean productivity value was determined as 6.41 m3 per hour. Cost analysis was used for calculating the machine cost and was estimated as US$12.64 per m3. Operation phases most effective on total time and productivity were determined as lateral outhaul, hook and inhaul. The felling sequence should be chosen with consideration for efficiency, wireless should be used between yarder operator and choker setters for communication, and much more choker should be used for loading. Further yearly working times of machines should be increased. In Turkey, timber haulage is a difficult, expensive and time-consuming operation, especially where the forests have drawn away up to the mountainous areas. Meanwhile quality and quantity losses are big problems in these areas. Primary transportation that covers all activities from felling to the landings constitutes the most expensive phase in wood harvesting. The studies show that logging costs take up 25 to 50 percent of total production cost. The objective of the studies is to identify intermediate logging techniques that would improve efficiency in wood harvesting for foresters. The main criterion for the decision is efficiency, which may be defined as reaching the desired objective at the lowest possible cost. The objective must include not only the production of logs but also protection of the forest and the environment, and all other constraints that apply to logging operations. The main elements affecting timber haulage are terrain conditions, average solid content per stem, available technical possibilities, the road network and skidding distance. Timber haulage methods must preserve forest resources through improved environmentally oriented efficient operations and increase forest resources through new plantations (Hasdemir, Acar and Eroğlu, 1995). 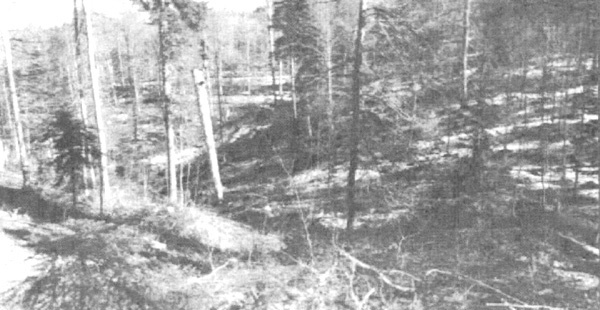 The production rates and costs of harvesting smallwood were determined for the Koller K300 operating under variable conditions: the size of crew, the addition of a skidder to swing logs from the landing and the type of harvest method employed, either conventional or hot thinning (simultaneous felling and yarding of whole trees). The slope of skyline and height of carriage is important for short distance skylines for log transport (Hochrein and Kellogg, 1988). The yarder used in this study was a Koller K300 two-drum machine to determine productivity and cost in the west Black Sea Region (Kastamonu) of Turkey. This research took place in the Kastamonu forest region of Turkey that has dense forest areas. The total area of the region is 1 324 065 ha, and 57 percent of it contains forests. Hauling studies with the Koller cable systems were realized in two separate sample sites in the Sarniç forest district of the Kastamonu forest region (see Table 1). The stand contained a mixture of Fagus orientalis and Abies bornmülleriana. The Koller K300 can be mounted on a tractor with a three-point hitch or on a trailer with its own engine. The tractor-mounted version used in our study is powered by a Ford 50 horsepower, gasoline engine. The transport distance of the skylines is 300 m and the daily transport capacity is 30 to 60 m3 on average. The thickness of main lines is 16 mm, while the drawing rope is 10 mm thick and 350 m long. The safety ropes are 30 m long with a thickness of 16 mm. Four workers are employed in operating the skyline. The skyline has a weight of 1 500 kg excluding the tractor. The average drawing speed of rope is 192 m per minute, and the height of the tower is 7 m. The time for mounting the skyline is 3–5 h, while the dismounting time is 1–2 h. The number of safety ropes ranges between 2 and 4 (Öztürk, 1997). The equipment used in the application of the method employed in carrying out the time studies involved in this work are the time-study recording disc, time-study forms and chronometers. In this study, the method of continuous measurement of time was employed. The complete timber haulage operation performed in this study, using the skylines described above, consists of eight stages. A chronometer measured the time required for the completion of each stage. To write down the research value, cards were prepared before leaving for the land. In preparing these cards, different columns were made for each work phase of extraction from separate compartment activities. Besides, a column was formed on land record cards to record loss of time and the tour number. Data obtained from time research on different harvesting areas were entered in the computer according to the kind of wood, and tables were prepared as to work phases. Then data obtained from the statistical analysis were compared. Costs relating to skylines were determined according to the cost analysis method used by Acar (Acar, 1994). In this analysis, it is assumed that the amortization time is 10 000 h, the average monthly workdays are 26, the daily working hours are 8, and the average rate of interest is 60 percent for 2001. The purchase price and operator wages required for the cost calculation, however, were obtained from catalogues and accounting records respectively. The machine rent was calculated according to unit prices determined by the General Directorate of Forestry and valid for 2001. Calculations were made in US dollars. Timber and firewood were produced from beech and fir stands in sample sites. Uphill yarding was applied. 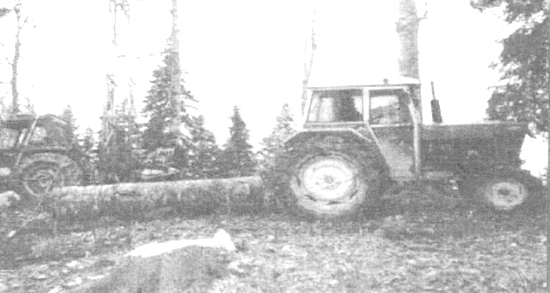 Hauling of beech and fir logs with a Koller K300 skyline is shown in the figures below. Crew size included one operator, two persons in loading, one person in landing and one person ensuring communication between the loading workers and the operator. With the exception of the operator, the workers were chosen from uneducated villagers. They were accommodated in a caravan next to the workplace. Mean time values obtained from time studies are given in Table 2. These values are the average of values on 40 work cycles. Mean productivity was 6.41 m3 per hour (see Table 3), which is appropriate according to Turkish and European conditions. The time to take the carriage to the loading area, to pull down the empty hook to the ground, to pull down the loaded hook and to pull the empty hook to the carriage were measured as standard and low value. The time consumed to pull the load to the carriage and lock it, as well as pull the loaded carriage to the unloading area, are related to the capability of operators, the power of the skyline, and volume and weight of the products. High lead cables were used while heavy and long timbers were hauled. Because of this, the machine was forced and more time was lost because it kept getting stuck. 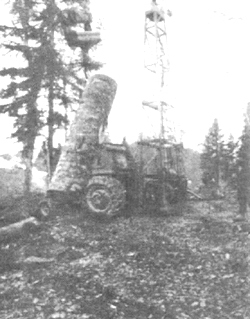 Additional equipment used in the landing area included a rubber-tyred, choker type tractor to skid logs in order to prevent accumulation. 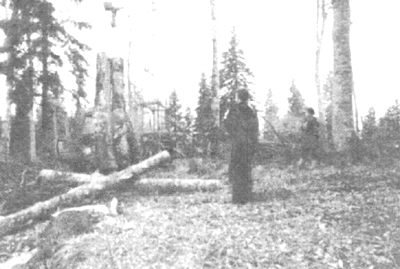 Accumulation in the landing area must not be allowed and logs must be pulled from the landing to the stacking place on the roadside as shown in Photo 4. When the time required for the empty loading hook to be brought down to the place of loading is compared with the time required for loading the hook, it takes three times as long because the empty loading hook with its own weight descends slower. This delay can be eliminated by joining an additional weight onto the loading hook. Moreover, to prevent loss of time because of breakdown, spare parts must be available for repairs. The effect of work segments, time loss, the number of parts carried, the height diameter of the product, the volume of the product transported, the transportation and dragging distance on the total time obtained at the end of time studies on the production areas were put forward as a result of the regression analysis. The duration of the dragging and fastening of the hook onto the product (w3), skidding the product into the carriage (w5), and bringing the loaded carriages to the unloading areas (w4) have been effectively decreasing these durations and will result in shortening the total time employed. Of these variables, the duration of the dragging and fastening of the hook onto the product can be shortened by good cutting arrangements, using a good number of chokers and having many workers at the attachment area. When the number of chokers is great, the remaining chokers are attached to the logs while they are being drawn to the unloading area. By attaching the already prepared hook to the choker, the loading time is shortened. The shortening of the skidding time of the carriage can be achieved by removing the roots, weeds and similar things of the trees at the skidding area, as well as by choosing the best route, using qualified workers and by using wireless communication between the workers and the operator. The time spent to bring the loaded carriages to the unloading area can be shortened by preparing the products with respect to appropriate weight and size and according to the transportation capacity of the machine, as well as by placing the machine so that the cable is at a certain height from the ground. Annual average skyline study hours have been found to be 187 h according to the records of the Kastamonu Forest Enterprise. These data have been used in calculations. The wages of the operators have been established at US$ 1 002 and the fuel consumption of skylines at 2 litres per hour. The costs of transportation by skylines for harvesting areas have been calculated according to the information below, and the productivity of skylines on harvesting areas has been taken into consideration. Although productivity values on harvesting areas have been found high, the annual productivity of the skylines is low because the machine is not used enough. General cost values became high because of low annual work times. As a result of measurements by the Koller K300 yarder, the mean productivity value was determined as 6.41 m3 per hour. Cost analysis was used for calculating machine cost and estimated as US$12.64 per m3. The operation phases most effective on total time and productivity were determined as lateral outhaul, hook and inhaul. The felling sequence should be chosen considering efficiency, wireless should be used between yarder operator and choker setters for communication, and many more chokers should be used for loading. Yearly working times of machines should be increased. The loading of the product onto the carriage changes according to the way the hook approaches and fastens to the product, dragging from the side and structure of the land. Moreover, it is affected by the scattered pattern of the logs that are to be carried. Whether or not transportation will be by air is undetermined beforehand, and since the airline route is not known, these periods appear as the longest. If the cable cranes are used at the production areas, the routes should be determined before cutting. The distribution of the logs over the land should be arranged according to the transportation distance and there should be no impediment because of roots, for example. Moreover, much time loss can occur if the haul cable snaps during the raising of a heavy load. In order to avoid time loss arising from consequent breakdowns, haul cables should be kept on the bench and repaired as soon as possible. A study should be made before skylines are set up to find thinning areas where the corridor could best be cleared so as to cause less damage to the forest. A communication system should be set up between the loading worker and the skyline operator. More chokers should be used for loading. The location of the machine in the unloading station should be selected carefully. Logs should not be stored in a place that would obstruct the operation of the machine: nor should the products be loaded on tracks immediately. Annual transportation plans should be prepared before harvesting in order to show where and how harvesting activities will be taking place. A perfect felling plan should be made where skylines are to be used so that the time consumed for hooking and pulling of the load to the carriage - the most effective phases in productivity of skylines - would be reduced. To prevent loss of time because of breakdowns, there should be abundant spare parts available in depots for repairs. The skylines should be repaired immediately. To increase total productive work time, maintenance and repair of carriages, chokers, and cables must be done at the beginning of the work. In mountainous areas, as well as in areas where road construction costs are high, the use of skylines in timber haulage operations would be the most economic and convenient method with a short-distance skyline like the Koller. Acar, H.H. 1994. Transport plans in forestry and preparation of forest transport plans for mountain regions. KTU, Forestry of Faculty. Trabzon, Turkey (Doctorate thesis)..
Acar, H.H. 1997. An investigation on the extraction from compartment by mobile skylines at the mountainous region. Journal of Turkish Agriculture and Forestry, Vol. 21 (2), 195–200. Ankara, Turkey. Aykut, T., Acar, H.H. & Şentürk, N. 1997. An investigation on the comparison of Koller K300, Urus M III and Gantner Skylines used for extraction from compartment in Artvin Region, I.U., Journal of Forest Faculty, Series A, Vol.47, 2. Istanbul, Turkey. Erdaş, O. & Eroğlu, H. 1999. Technical and economical analysis of short-distance Koller K300 Yarder used for the extraction of timber in Artvin Region, Journal of Turkish Agriculture and Forestry, Vol. 23 (5), 1249–1256. Ankara, Turkey. Hasdemir, M., Acar, H.H. & Eroğlu, H. 1995. Koller K300 Mobile Yarders, I.U., Journal of Forest Faculty, Series B, Vol. 45, 3–4. Istanbul, Turkey. Hochrein, P.H. & Kellog, L.D. 1988. Production and cost comparison for three skyline thinning of applied forestry, Western Journal of Applied Forestry. Öztürk, T. 1996. Capability possibilities of winch skylines in Artvin, MS Thesis, I.U. Forestry Faculty. Istanbul, Turkey.